You know how writing about yourself can be hard work? And how overthinking everything can lead to either tangled knots or brilliant insight? Well, yeah. That just happened. Yesterday I met with the editors from Affirm Press, Ruby Ash-Orr and Kate Goldsworthy. It was a very positive discussion (despite my terror going in – all me, Ruby and Kate, all me). We talked about the shape of the book, how I’d handle publicity and sticky questions (that’s promising, right? ), and the character functions in the story. There are too many bad guys, but no way to know which one is THE BAD GUY. And that’s where my theory nerd kicked in. I teach critical theory for creative writers and so read all that stuff that most of us would like to forget from our undergrad days. 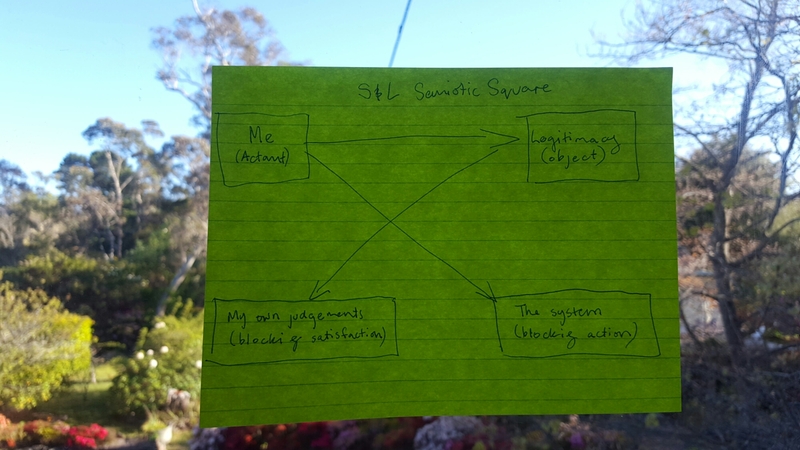 As soon as Kate said the words ‘character functions’, I immediately jumped to Vladimir Propp‘s character functions and Greimas’s semiotic square. Joshua’s alignment of these characters and drives with characters from Die Hard makes understand the hero’s journey easier to engage with. The Actant, John McClane, wants nothing more than to reach the object of his desires, Holly Maclean. His ultimate path to satisfaction is blocked by the villian, Hans Gruber, with smaller blocks to action being provided by the unnamed terrorists. John can only overcome the final block to his satisfaction (Gruber) by first overcoming the unnamed terrorists. I needed to find my Hans Gruber. So I post-it noted the problem (small aside, Joshua was also the person who introduced me to these amazing post-its). The Actant was easy – I am John McClane. The Object, also easy, my Holly is legitimacy, self-actualisation, freedom (from prison, abuse, pain). At first I assumed my Hans Gruber was the system. Then I thought. And thought. And thought. If the system is Hans, then who are the unnamed terrorists? Who do I need to throw down an elevator shaft? Tie to a chair with Christmas lights? Then I looked at the characters in the book. Chihuahua Face, Mr America, ButchyMcButchButch? They all end up down their own elevator shafts. The parole board? Police? Corrective services? None of them actually have enough power in my world to be Hans. All these different faces of power and authority are blocking my actions and desires, but not my satisfaction. Then I thought some more and stuck this goddawful post-it up on the beautiful window. I AM HANS GRUBER AND JOHN MCCLANE! Sigh. Thank you, Structuralism. Good thing I’ve got a phone sess with Shrinkola lined up for this afternoon. Thanks for the post Angela. Very interesting & I love Varuna – wish I was there right now. Close your eyes for just a second, Sally, and I’ll send you a whiff of the stairway. Walking up them always feels like coming home.